You Are Here: The Suburban Bird Dog Zone -> Flexi-Physics: A Deal With The Devil? It's seductive, that picture you see in the catalogs. There walks the lithe, sportily dressed, happy-looking woman with the wagging 90-pound Yellow Lab frisking along the sidewalk a luxurious ten feet away. Beware. Look away! She's a foul temptress - a pet product siren, luring undisciplined suburban bird dog owners to their doom. Well, it's not quite as bad as all that, but the old saw about things seeming too good to be true can sometimes be right. When you're out for a neighborhood walk, are you signaling (leading) ... or are you restraining (leashing)? and prevented from running off and being his own dog. But listen carefully to people in the dog handling world (especially show handlers and obedience trainers) and you'll hear instead the word "lead." That's a subtle difference, but it's important. To those handlers, a lead is usually a much less substantial thing, used to remind the dog that he's on the job... but his willingness to go where you're going and do what you're doing is supposed to be a matter of habit and happiness - not a contest of strength that depends on a heavy duty piece of stitched nylon or leather. Watch handlers in a conformation show ring, and you'll see them heeling a 150-pound Newfoundland around with a gossamer-thin wisp of braided leather, the better not to distract the judge's eye from the handsome animal. Of course, if you've spent much time with a pointer or setter, you'll hear the word "heel" and either laugh out loud or get a grim, cloudy look on your face. We don't want to make too much of the semantic contrast between "leash" and "lead," but thinking about the difference between those words is a good opportunity to reflect on the relationship you have with your gun dog. When you're out for a neighborhood walk, are you signaling (leading) her, or are you restraining (leashing) her? The Flexi Comfort Grip Retractable Lead for Large Size dogs is ergonomically shaped and made of soft rubber so it's comfortable to hold. Extends to a maximum of 16 feet and is recommended for dogs up to 110 pounds. A retractable leash is usually a plastic handle assembly with a length of material (usually something like nylon-clad parachute cord) spooled up on a spring-tensioned reel. The cord will pay out without much resistance, and will wind back into the housing very quickly unless a locking mechanism keeps it slack. Ideally, this means that you can stand in one place and have the leashed dog move out and back while the cord stays in a slightly taught state, feeding in and out as the dog moves. Sounds great, doesn't it? The allure (or, really, the fantasy) - especially if you have an active, hunting-minded dog in suburbia - is that as you walk along, the dog can get in that extra bit of zig-zag and orbiting movement around you. Each bush you pass can be dashed over to, each smell can get a bit of a linger, and the dog can be a bit of a hunting dog, right? If you're feeling short on space to exercise an active, prey-driven dog, it can be tempting to look for anything that will let that dog burn off a couple of extra calories on every outing. But what signals are we sending when we use the retractable leash for this purpose? Bird dogs thrive on having this sort of liberty in the field. But after even one taste of it, a relaxed walk on a slack leash is just that much more of a challenge. Let's try to see it from the dog's point of view, as we head out on the ritual walk around the usual neighborhood circuit. Rover knows exactly where we're headed, because we've done it a thousand times. Especially with a male dog, this means we're on a milk run, with a bunch of regular stops that demand inspection and attention. Unless something interesting pops up between those familiar waypoints, nothing could be more compelling than getting to those spots as quickly as possible. This might be a territorial marking issue, or the knowledge that a particular hedge usually produces some doves and that the treefall fifty yards down the way is home to a colony of ill-mannered chipmunks. Make the same path on a regular basis and the dog will either start to sleep his way around the route, or will seek to make his own excitement by trying to get to his favorite objectives in record time. With a non-geriatric bird dog, it's usually the latter. Enough can't be said about the pleasure (and safety, especially when you're carrying a shotgun) of having a dog that will heel on command and stay in that mode until released. But for some dogs, a lead is just a physical encumbrance like gravity, to be overcome through strength and determination, and over time ignored as just a fact of life - and thus, it becomes a leash. The psychological fortitude required (on the part of the owner) to break through the dog's adventurous spirit and get him thinking in terms of heeling can be almost unattainable when working with some breeds. In essence, short of being incredibly heavy handed and getting a sulky heel out of fear, you have to make heeling a more satisfying experience for the dog than doing what the dog wants to do (check every tuft of grass, sneak up on every squirrel, and spread his wonderful scent as far and wide as possible). That's a tough assignment. Your bird dog should want to please you, and if you make the dog aware that you're pleased with how things are going, he'll be glad he's pleasing you. But can the pleasure he gets out of that ever hold a candle to the prey drive that is the core of his being? Some days, the answer can only be no. For hunt-or-die dogs, the leash issue isn't about showing him what you want (since after a few serious, undistracted episodes of basic obedience work, he'll know - and don't let him kid you about that). He knows what you want, and the question is one of keeping his recollection of what you want, and the resulting actions, foremost in his mind. One can do this through nearly constant communication with the dog while heeling and walking, but most every walk is through a minefield of potentially deal-breaking distractions. No matter how focused that dog is on the human strolling next to him, walking one inch into the scent cone of something that Rover's deep-down predator wiring tells him to investigate will sever the connection. The only thing maintaining that connection is the lead or a truly show-stopping response to another stimuli like a solid vocal command, whistle, or e-collar. For a younger or particularly driven dog, a non-tether-like control will nearly always fail when the diversion is compelling enough (say, a cottontail breaking from the cover right next to the sidewalk). For safety's sake, walking a bird dog in a suburban setting essentially demands reliable physical control over Rover's freedom of movement. So, let's say you're walking in a local park and have a commanding view of your surroundings. You don't want Rover to rove too far, but you'd like him to be able to sniff around and do his business without being within only a normal leash's five or six foot range. That retractable leash starts looking pretty good, and that's where the seduction (and the trouble!) can begin. Whether it's across a parking lot, down a sidewalk, or through a park, moving from one spot to another must happen at your pace, and not at Rover's. He will have different ideas about this. So, if you're following commonly held practices, Rover's walking at your left heel and waiting for permission to get out in front or to jump to the side for other activities. Proof that Rover's keeping the rules in mind will be a slack lead - meaning, the leash is hanging off of Rover's collar and describing a nice loose "U" between dog and hand. A good workable leash is usually made of sturdy woven nylon webbing or heavy duty leather, and even when you're not looking down at it, the swing and sway of it will tell you whether Rover's starting to take up that slack with his own idea of a course change. If Rover stops short, or spins around, or does some other sort of leg-lifting gymnastics, that heavy lead will generally not get dangerously tangled. Now, if you trade the heftier five or six-foot lead for a retractable device, that section of material hanging slack between the two of you will usually be a thin (about 3/16ths of an inch) cord that has almost no weight to it. That wispy section of cord becomes a much less physically useful transmitter of Rover's body language, so you're now on the hook to spend more time watching what he's up to (rather than looking around for the things that are likely to push his buttons). In order to maintain this slack-lead condition with a retractable, you've got to either keep your thumb on the reel lock, or (assuming the model you're using has one) use the latching mechanism. This turns the retractable into essentially a fixed-length lead with a handle on it - which can actually be a nice thing, in terms of ease of grip. So, what are the dangers, in this configuration? If you've got the length set to about the same as your traditional lead, it's business as usual, right? Not so. The thing of which you've most got to be aware, even with the leash set that short, is the nature of that tether/cord material. If Rover takes a quick lunge to the side, that cord can drag across your legs and produce a painful impact. Remember: if Rover does that with a one-inch wide nylon lead, the impact is spread out by the thickness of that lead. When the same force is delivered to your leg by something smaller (like that retractable cord - less than a quarter of an inch thick), all of that energy is going to impact your flesh in a much smaller area. If you bruise easily, this sort of thing will leave you black and blue (and often striped-looking). Boots or long pants are always a good idea when working with high-energy field dogs. 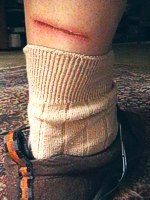 But poor judgement about a moving dog, a slack retractable cord, and some exposed skin can result in a burn like the one above (that one was a combination of a 26-foot Flexi leash, short socks, and not paying enough attention to the body language of an 80-pound, toy-chasing Pointer). Ouch! But imagine if that cord had caught a small child on the face or neck. The other problem, with the lead in fixed-length mode, is that as soon as Rover stops moving, or turns around for some reason, the slack in the cord quickly drops down near his (and your) feet. Rover will display an uncanny ability to get tangled in the cord. And while that may be an inconvenience, the real worry is what happens when Rover takes off again (after that squirrel or blowing leaf). When that lead comes taught again, especially if it's in a hurry, it may be wrapped around a leg joint or even his neck. With a heavier lead, that's not so much of an issue, but that thin cord is an instant, abrasive tourniquet. Because the cord will usually drag across Rover's skin (or yours) as it becomes taught, the last few inches of movement can produce a hellish case of rope burn. Not to be too graphic, but the braided surface of the cord, at the very small scale and compared to epidermal cells, is pretty much a chain saw. Not only that, it's an abrasive surface that has probably been dragged across the ground, seen its share of leaf mold, squirrel droppings, poison ivy, and more. Whatever's embedded in the fibrous texture of that cord is going to get deposited in the freshly opened patch of skin it just caused. Ouch, in the short term, and possibly antibiotics and a scar in the long term. The farther that cord is payed out, the worse the risks. When you've got 15 feet of cord between you and Rover, you have that much less control over what happens. Perhaps less of a risk, but as much of an annoyance, is the old once-around-the-shrub problem. Some dogs seem to figure this out early, and learn not to tangle themselves too badly (or, learn how to go back around the tree trunk the same way they came). But other dogs will get tangled up, and before long, think that bush is trying to attack them, and try to run off, making the problem worse. Handlers that let this happen spend a lot of time pushing into the very bushes they were hoping that retractable leash was going to help them avoid. The biggest risk, though, with the out-at-20-feet dog on the leash, is the appearance of other dogs or people (especially children). The socially friendly or prickly dash over to greet or check out others can result in even worse rope burns, clotheslining, tripping, ankle sprains, and worse (the warnings that come with these products actually come right out and proclaim the risk of cuts, burns, and amputations!). Mostly, this is just the laws of physics working. When Rover gets to pick up some speed, the energy involved in that leash's ultimate friction and impact on other objects is going to go up hugely. Even without other objects (or legs) in range, you face another source of damage. As Rover gets to the end of that lead, all of the energy of his moving body is going to have to be transferred to the handler's body when the slack runs out. The handler gets a shock (or loses her grip on the lead), and Rover's neck gets a pretty good twang, too. It's easy to forget how much energy we're talking about here, but imagine that the 50-pound dog on the leash is instead a 50-pound bag of Rover's favorite dog food. If Rover's on one side of you, out at 20 feet, sees something exciting on the other side of you, and is allowed to take off in that direction, that's 40 feet of acceleration time. A healthy bird dog can easily get going 20 miles per hour in just that short space. Now, imagine tying a rope to that 50-pound bag of dog food and hanging onto the end as you toss the bag out of a car going 20 miles per hour. Something's got to give, or someone gets hurt. Handlers used to having a highly maneuverable dog on the end of a retractable leash learn the importance of moving with the dog as that leash comes to its end. Being a human shock absorber (allowing the running dog to feel some tension on the lead and to come to a stop over a couple yards, rather than abruptly) will not only save wear and tear on Rover's vertebrae, but also on the handler's shoulder, biceps, elbow, wrist, and hand. It also decreases the risk that the lead cord will snap, just as Rover's chasing that squirrel into the street. Which brings us to the most common ways in which retractable leashes fail (which they all will, eventually). Traditional heavy fixed-length leads rarely break. Sometimes the stitching can give way (but you'll usually see that happening over the course of months), but usually it's the clasp that goes first, sticking open or corroding past usefulness. The clasp on a retractable may give up in the same ways, but the reel mechanism or cord materials are far more likely to die first. Repeated full-out stops on the leash can put a lot of strain on the coil spring or the latch, sometimes snapping those mechanisms internally. Usually at that point you wind up with a long, floppy 20-foot cord leash with a handle on it. Rover can't run off, but with the retraction action dead, control can be very awkward. The potentially more dangerous failure is the cut or broken lead cord. The cord usually terminates in a knot inside the reel housing, and that knot can give way under stress. But the more common problem is damage to the exposed length of cord. The usual cause of cord fraying is abrasion as the cord drags along rough or sharp surfaces. This typically happens as Rover dashes around the corner of a masonry structure, rusty signpost or the like. Such surfaces are like sanding blocks to the nylon cladding that protect the internal fibers of the cord, but that type of damage tends to happen over time, and you can see it before it's a threat to the strength of the leash. More abrupt failures occur when something causes a more slice-like wound to the cord. In a suburban setting, such damage happens where one might least expect it, and one of the frequent hazards is, believe it or not, parked cars. As Rover hustles around that parked vehicle to go mark a fence post at the edge of the driveway, the leash cord will drag across the car right about the same height as the car's bumper and other lower body panels. Almost without fail, the cord will slip right in between panel joints, or behind the plastic shrouds at the end of a bumper. This happens very quickly, and even if the cord pops back out on its own, if may have sustained a deep cut on a hidden metal surface. Worse, this happens near where there are usually other cars moving - and just when you most depend on that leash to prevent Rover from winding up in traffic, it may have been dangerously weakened. Length? Well, if you're going to use one of these devices, you might as well get one with as much length as is available in a decent unit. Most of the better models range from 15 to 20 feet, and you can always choose not to let a longer cord play out all the way. Just remember that every extra couple of feet amplifies almost all of the concerns mentioned above. Heft? Most bird dogs, even the smaller ones, are way too energetic for the smaller Fifi-sized retractable leashes. The models made for larger dogs weigh a bit more, which may be annoying to someone with smaller hands, but they'll hold up better and it's worth the extra few dollars. Extra features? Things like flashlights and doggie-bag dispensers may seem cool, but are often eventually broken, in the way, or just add too much to the cost for what's provided. A cushier foam grip is, though, a worthy feature for some handlers. Probably the most important variation from one brand and model to the next is the way that the last foot or two of the leash cord is fitted out. The better units have the cord terminate in a length of nylon webbing with a loop stitched in. That last bit of lead will not retract into the handle, but your dog will always be at least a couple of feet from your hand anyway. More importantly, the loop provides another way to control a rambunctious dog without having to put all of the strain on the internal reel locking mechanism. The Flexi Giant is a 26-foot all-belt retractable for large and strong dogs or rough conditions. It's the big cahuna. Probably the most substantial retractable out there is the Flexi brand "All Belt" Giant model, which, rather than using nylon cord for the length of the leash, uses flat nylon webbing on a larger, semi-exposed reel assembly. The reel housing is thus a bit larger, the unit is heavier, and the handle's orientation may not feel quite as ergonomically elegant, but the Giant can be much better suited to field use. The heavier belt is less likely to cause an injury when tangling up a dog out at over 20 feet. The downside is that the webbing belt picks up more water and dirt, and can convey more seeds, burrs, mud, grit, ice, and other material into the roller mechanism in the handle - and that can sometimes be too much for the tension spring to overcome, leaving you with a non-retracting leash when you may least want one. The semi-exposed reel, though, does lend itself well to cleaning up. So: to use, or not to use? There are too many variables to make that an easy question. A retractable's a great tool to have available, and for most bird dog owners the main focus is going to be on using it without teaching the dog bad habits. The biggest issue is heeling, with too-casual retractable use likely to undo or prevent a lot of important obedience work. 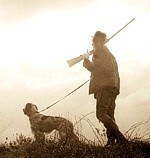 Your birdy hunting dog wants to get out in front of you, so heeling is a hard enough discipline in the first place. If you can make the dog aware of when it's OK to make use of the retractable's orbit-range and when it's time to heel, then you've got a good working relationship with Rover, and this type of lead is worth every penny. If you're more inclined to indulge your pup's many natural whims while on a leashed walk, you're going to want to proceed more carefully.